Bank of England Panic! 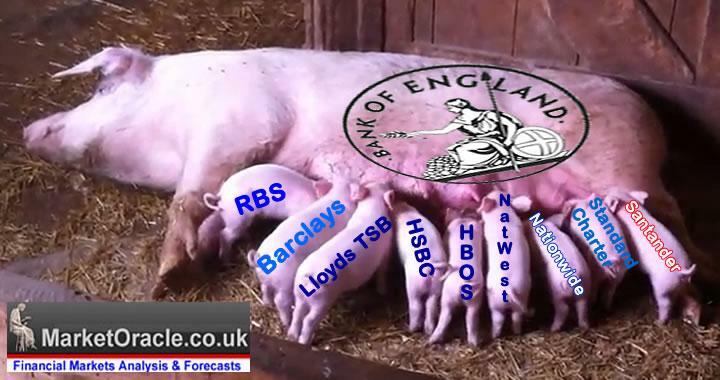 Scottish Independence Bank Run Already Underway! 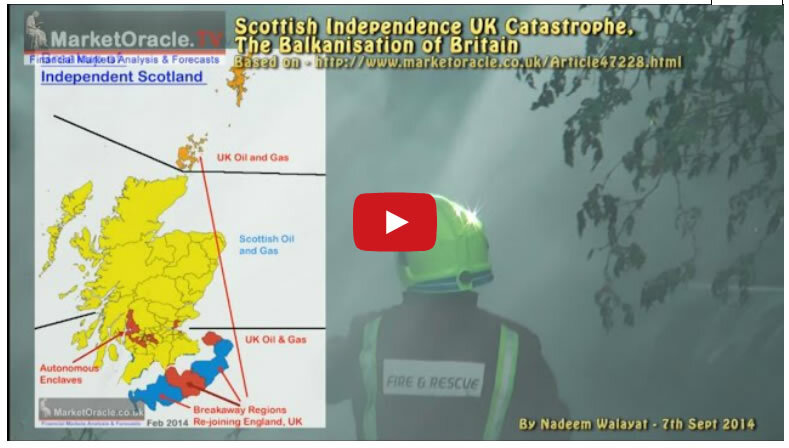 Whilst the epicentre of the bank run is Scotland as Scottish banks haemorrhage bank deposits, however the risks of Scottish independence is resulting in a flight of capital out from the whole of the UK which so far this year has seen more than £100 billion leave the UK which is set against an inflow of approx £50 billion for 2013. And the amount of capital outflow is accelerating as evidenced by the mainstream press recently partially waking up to what is taking place by reporting on the £17 billion of outflow for the month of August alone. However, we won't know the statistics for September until well into October so the place to look for the answer as to the intensity of capital flight from the UK is the British Pound, for depositors and investors pulling funds out of the UK would SELL Pounds for other currencies such as the Dollar and Euro. In this respect sterling's slide has accelerated during September reaching a recent low of £/$1.60, near twice the decline for the whole of August which suggests that the UK could have seen as much as £34 billion leave the UK so far this month that could more than triple if Scotland actually does Vote YES. 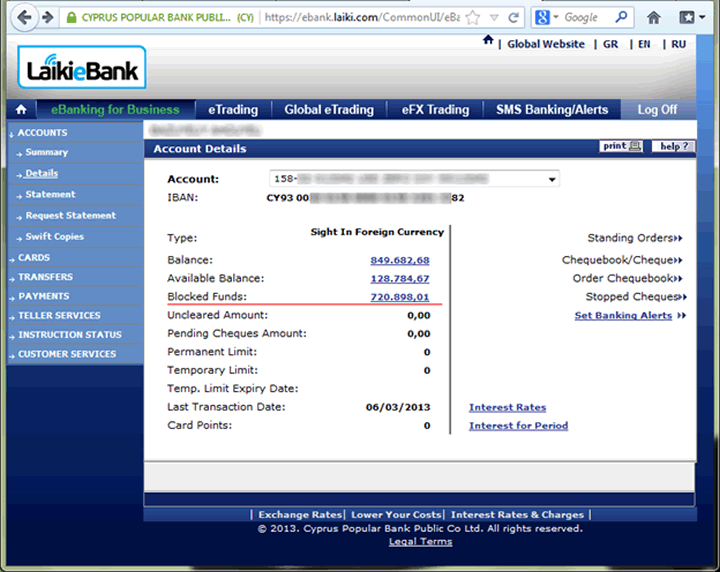 Where it would not surprise me if the the British Pound plunged to under £/$1.50 as panicked investors sold UK assets. Therefore by the end September, following a YES vote the UK could have experienced its worst month ever in terms of capital flight of as much as £100 billion that would be in addition to the 100 billion already pulled out of the UK upto the end of August, and there would be little that the politicians or Bank of England could do or say to prevent the exodus of capital continuing for many months more to come. However such scottish nationalists central bank sharing delusions are just not going to happen as two nations CANNOT effectively share the same bank account! The scottish people should not be taken in by these blatant LIES because it is just NOT GOING TO HAPPEN! Foreign investor fears of an Independent Scotland effectively parking a trojan horse outside the Bank of England is triggering flight of capital out of the UK that can only intensify AFTER Scotland votes YES that will act as a tightening noose around the British Economy for the duration of a near 2 years of bitter negotiations of separation that investors will just not put up with the uncertainty of. Whilst the Scottish Nationalists convientely try to forget the fact that had Scotland been Independent at the time of the financial crisis of 2008 then its bankrupt banks, namely RBS and HBOS given their more than £2 trillion of liabilities would have bankrupted Scotland's £160 billion economy more than 14 times over! in an economic collapse many times worse than Greece, and probably worse even than the spectacular near overnight collapse of Iceland. The bottom line is that the likes of RBS and HBOS will be able to run rings around Scotland's inexperienced, inept or corrupt politicians which ensures that another financial collapse would be CERTAIN no matter the promises politicians make today. IT WILL HAPPEN AGAIN and probably far sooner than anyone can imagine. Scotland's financial sector is near twice the size relative to the Scottish economy than were that of Ireland, Iceland, Cyprus or Greece! The Scottish nationalists are delusional if they imagine that the financial markets would accept such a risk following a YES vote as today Scotland does not underwrite the Scottish banks but rather it is the whole of the UK which effectively means ENGLAND that stands behind Scotland's banks. No one is going to keep a single penny in a Scottish bank following a YES vote backed by the Scottish government because they fully understand that it would be impossible for Scotland to ever make good on any bank deposit guarantees that SNP politicians would make because the credit ratings agencies would immediately rate Scotland and ALL of its banks as JUNK as a consequence of bank liabilities, that effectively would instantly make ALL of Scotland's banks insolvent that no financial institution would want to do business with. While no banker will officially acknowledge that a bank run is under way due to the obvious reason of intensifying the panic underway. However the signs of banking sector panic are clearly apparent as ALL of Scotland's major banks who had previously committed themselves to staying silent during the independence campaign, instead early last week panicked into announcing statements attempting to reassure fleeing depositors that they would effectively become ENGLISH banks following Scottish Independence YES vote as they declared contingency plans to move their headquarters and legal entities South of the border which translates into Should Scotland vote YES then ALL of Scotland's major banks will in large part quit Scotland. 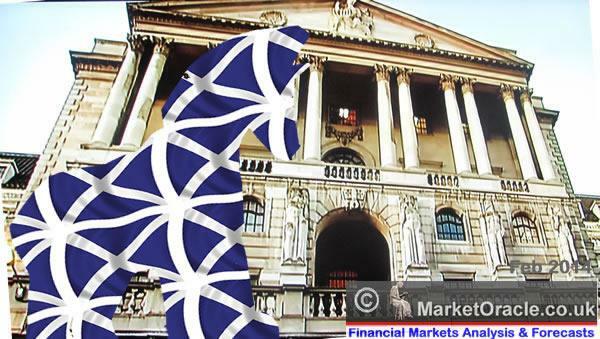 The Royal Bank of Scotland Group plc ("RBS") confirms that, as set out in the risk disclosures in RBS’s Annual Report, there are a number of material uncertainties arising from the Scottish referendum vote which could have a bearing on the Bank’s credit ratings, and the fiscal, monetary, legal and regulatory landscape to which it is subject. For this reason, RBS has undertaken contingency planning for the possible business implications of a ‘Yes’ vote. RBS believes that this is the responsible and prudent thing to do and something that its customers, staff and shareholders would expect it to do. As part of such contingency planning, RBS believes that it would be necessary to re-domicile the Bank’s holding company and its primary rated operating entity (The Royal Bank of Scotland plc) to England. In the event of a 'Yes' vote, the decision to re-domicile should have no impact on everyday banking services used by our customers throughout the British Isles. However, RBS believes that it would be the most effective way to provide clarity to all our stakeholders and mitigate the risks previously identified in our Annual Report. Furthermore, I would not be surprised that that it won't be long before the likes of the Royal Bank of Scotland (RBS) that despite a near 300 year history of existence will announce that it is changing its name to the Royal Bank of England (RBE), all to prevent the bank run panic from worsening. In view of the uncertainty around Scotland's constitutional future, we have put in place precautionary measures which would help enable us to provide customers with continuity. This includes planning for new regulated companies in England to which we could transfer parts of our business if there was a need to do so. We will continue to serve our customers in Scotland and will consider what additional measures we may need to take on their behalf as a consequence of constitutional change once further clarity and certainty is received. The chief economist at Deutsche Bank David Folkerts-Landau said "voters and politicians had failed to grasp the potential severity of the negative consequences of separation. "A Yes vote for Scottish independence would go down in history as a political and economic mistake on a par with Winston Churchill’s decision in 1925 to return the pound to the Gold Standard or the failures by the Federal Reserve in America that triggered the Great Depression in the 1930s. "Scotland risked a similar depression if voters backed the Yes campaign on Thursday, and described the desire for independence as an "incomprehensible" one which could have negative consequences "far beyond" what people had imagined. Additionally Deutsche Bank's global strategist Bilal Hafeez warned that "the economic uncertainty that would ensue from independence, the unstable banking system that would also result, would really result in the Scottish debt having to offer much higher interest rates to attract investors." The Bank of England and UK Treasury are effectively now in crisis mode ahead of Thursdays vote as they attempt to formulate contingency plans, which will mostly amount to open ended promises backed by UK tax payers in an attempt to to bring to a halt the run on British assets, much as took place during the Lehman's crisis of 2008 that was followed by 6 years of economic depression. To illustrate the degree of behind the scenes panic both the Chancellor George Osborne and Bank of England Governor Mark Carney announced yesterday that they would be pulling out of the G20 Finance Minister Summit due to take place this weekend. George Osborne stated - "For my own perspective I have taken the decision that I won't go to G20 finance ministers meeting in Australia next week. I think it is important, given the economic risks of one potential outcome of that referendum, that I'm here in the UK. "The Governor of the Bank of England has quite independently come to the same conclusion." A whole host of major business also warned of the dire consequences of breaking up the United Kingdom such as Asda, John Lewis,Tesco's. The bottom line is that following a YES vote Scotland's financial sector that lives off over 90% of its business coming from outside of Scotland would shrink to less than 10% of its current size, which is not going to be conducive to a newly independent Scotland's financial or economic stability. Alex Salmond's plan to continue to use sterling after independence 'sterlinglisation' ensures that when the newly independent nation soon runs out of currency reserves both as a consequence of socialist deficit spending and financial crisis, then the only place left to obtain such currency reserves would be to literally steal the bank deposits of the Scottish people Cyprus style, which I am certain will take place within a few months of Independence day. Businesses and individuals are realising that Scottish separation is inevitable therefore even if Scots vote NO this time people will now have to formulate and enact a strategy to deal with an Scottish exit from the UK. The bottom line is that for Scottish Nationalists independence is a religion in the pursuit of which they are willing sacrifice everything, therefore what England needs to do is to formulate a sustainable dissolution of the United Kingdom to protect England from the mayhem that would follow its destruction, even if it means constructing a new Hadrian's wall! For if destruction of the union does not happen on September the 18th then it will 20 or so years down the road! This is a wake up call for England to start to take measures to limit the huge amount of damage that will done to England from when the Scottish nationalist eventually succeed in committing suicide.